Three days covering the fundamentals of a lasting, correct & purposeful Kundalini Yoga Practice and ability to teach this. This course will give new teachers a firm grasp of what is important in a Yoga practice, the dynamics of proper alignment & how this applies to all Asana. This event is addressed to all level practitioners of Kundalini Yoga. A unique opportunity to take a leap in this sacred science! Con el curso de Alineación Divina aprenderás los fundamentos y conceptos básicos necesarios para tener una práctica cómoda de asanas y de meditación. Entenderás cómo construir y desarrollar las posturas, con los componentes centrales de cada asana. Aprenderás lo que Yogi Bhajan llamó La más alta forma de sabiduría: ¡Aprenderás a relajarte! Desbloquearás los patrones de tensión en tu cuerpo y en tu mente, para que puedas escuchar a tu alma. Disfruta de esta nueva oportunidad en México de practicar Kundalini Yoga de la mano de guías de talla mundial; aquí podrás ir más allá de la mente, donde podrás seguir a tu corazón. Del 2 al 8 de jun de 2018. Identity of a teacher in Kundalini Yoga Teacher Training. We will also be continuing to cover the fundamentals of a lasting, correct & purposeful Kundalini Yoga Practice. This will give new teachers a firm grasp of what is important in a Yoga practice, the dynamics of proper alignment & how this applies to all Asana. What does your Happy Heart look like? How you carry your heart affects the outcome you are looking for in your practice of Kundalini Yoga and your life! We will learn through warms ups, sound current, kriya and meditation how to project from the Heart and correctly practice Kundalini Yoga, so we can remove our shadow hearts; move into our light, true, brave, pure hearts; and practice yoga the same way we want to live: Happy-Hearted! In this course we will engage in three separate journeys, and each journey is comprised of seven stages; taking you step by step into a deeper level of awakening and realization. We will move through the rudimentary skills of meditation to the deeper levels of awareness and integration, and finally into identity, projection and merger in the infinite pulse of creation. This course is open to everyone. You do not have to be a Kundalini Yoga Teacher to take this course and people from all contemplative paths are welcome. Sign Up Today!! Join Us! It is recommended, but not required, that you purchase the book “The 21 stages of Meditation – The Journey to the Self”. 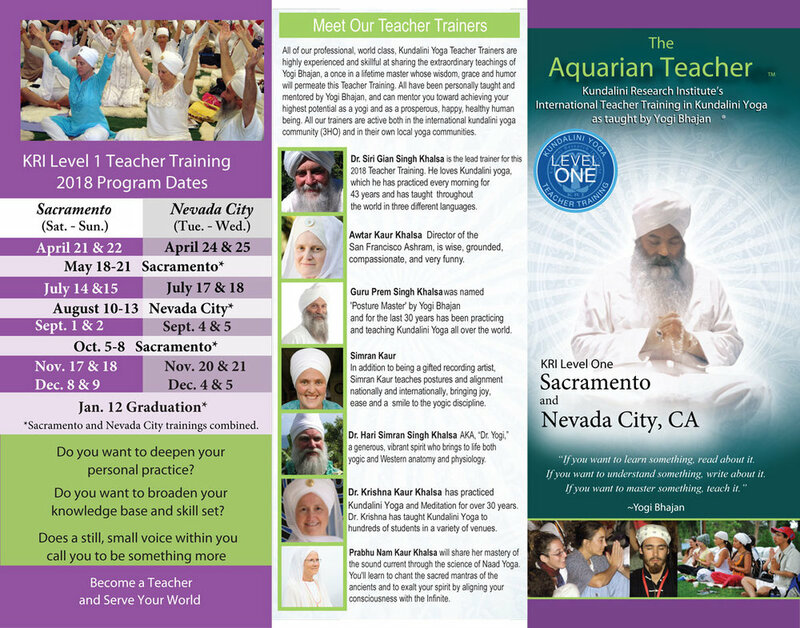 This teacher training program is for everyone, whether you desire to become a certified teacher or simply wish to deepen your personal Kundalini Yoga experience. The Kundalini Research Institute (KRI) Level One Certification course will give you a lifelong foundation for a successful yoga practice. You will learn the basic principles of Kundalini Yoga that Yogi Bhajan taught since 1969, and experience the practice and its effects first-hand, guided by experienced teacher trainers. Throughout the training program, you will receive powerful insights about yourself and the means to grow mentally, emotionally, physically, and spiritually; and this growth will radiate throughout your life, both personally and professionally. We have been training teachers in New York City since 1971. Those who aspire to become teachers and enroll in our teacher training programs will receive the knowledge, confidence and experience to become well-rounded, competent and capable teachers of Kundalini Yoga. You owe it to yourself to take your Kundalini Yoga practice to the next level. Please download, fill in and send us the registration forms below. This training is the First in Dalston, London!! Those who aspire to become teachers and enroll in our teacher training programs will receive the knowledge, confidence and experience to become well-rounded, competent and capable teachers of Kundalini Yoga. You owe it to yourself to take your Kundalini Yoga practice to the next level. At Kundalini Yoga East with Teachers Sat Jivan Singh & Simran Kaur, just off of Union Square in New York City! An in-depth experiential journey into the life enhancing essence of Kundalini Yoga and Meditation. Learning through your own experience and contemplation we will study the mind and meditation. There will be daily yoga classes, DVD classes with the Master of Kundalini Yoga, Yogi Bhajan, where he lectures and shares Kundalini Yoga and meditation techniques that will strengthen your capacity to be able to use the functional minds with fluency, understand the influence of the impersonal mins, cultivate shiny and apply intuition and intelligence with ease and flexibility. We will share new content in terms of information, techniques, and themes, but the essence of all Kundalini Yoga teacher training courses remains the same: to nurture your spiritual development, stimulate your applied mind, intelligence and awareness, and open opportunities in your life to deeply integrate the teachings of Yogi Bhajan and Kundalini Yoga. Studying at Kundalini Yoga East is a unique and transformative experience, and the group energy of Level 2 courses at our studio is unparalleled. The powerful skills you’ll gain in this program will not only strengthen your practice and teaching abilities, but will enhance your life. An exclusive tour of India, personally guided by GuruPrem and Simran who together have brought travelers to India over 15 times for once(or twice)-in a lifetime journeys! We will do yoga & meditation daily (not required), visit places that are holy, amazing, challenging, inspiring & beautiful! We invite a few on this spiritual, educational & fun adventure allowing for an intimate group of wonderful people to travel together. March 10, 11 & 13: Our trip begins in New Delhi a couple of days, you will acclimate at the luxurious museum of a hotel www.theimperialindia.com We will visit a famous Sikh Gurdwara (Temple), go sightseeing, meet people and there will be shopping. March 14th- 17th to fly to Shimla, a hill station where we will hike in the foothills of the Himalaya, see the majestic snowcapped mountain range! We will luxuriate at this special hotel in the forests at the majestic WildFlower Hall Oberoi Hotel and tour this hill station. Also, there is also a fantastic place called ‘The Rock Garden’, but that doesn't do it justice, a man spent his life transforming this area into art everywhere, much of it transformed with rocks, it is really special! A day trip to Majestic Anandpur Sahib to visit the Gurdwara where the Khalsa was founded, A phenominal Sikh Art & History museum, Yogi Bhajan's house and more! March 21-24th Travel to Amritsar, Punjab - Home to the Golden Temple (the #1 tourist destination in India), the Holiest of Sikh temples a really beautiful and special place, the house of Guru Ram Das, Lord of Miracles, where we can dip into the nectar tank & meditate in the vibration of the sound current that is constantly being sung there, we will visit in the early hours, as well as prepare food for everyone, serve and be served, a truly amazing experience! Visit Miri Piri Academy - A Kundalini Yoga & Sikh school where students from all over the world 20 countries & of every denomination come together to get an academic education, a spiritual discipline & be trained Kundalini Yoga Teachers, so that they can be the future conscious leaders, healers & teachers in the world, uplifting each other and humanity. www.miripiriacademy.org is just outside of Amritsar, our daughter & son attended & Simran is the Chairperson of the board of this school. We will also do a trip to the Border with Pakistan to experience the Wagga Border show. We will depart March 24th afternoon on flights to New Delhi where we depart India. If this is a once in a lifetime trip for you and there are places in India you want to visit that are not on the itinerary, let me know and I can help arrange your additional travel with guides and support. We will make all of your hotel reservations and arrange all in India travel. Have the whole trip organized arrival in Delhi to your departure and everything taken care of, a no worry trip! All Domestic travel by flight, train or car. Exclusive services of local English speaking guides on sightseeing tours. All Historical & monument entrance fees. Porters Fees at Railway stations & airports. Government Service Tax. Any drinks, food, meal (not included in hotel reservations, i.e. other than breakfast) personal use such as laundry, telephone calls, room service, etc. Tips and gratitude to drivers, bellboys, representatives, guides. Any massages or services other than the room reservation. Please confirm as soon as you can if this trip will work for you, so that we reserve your spot and so we can make your reservations! Contact me with any questions or to confirm. There is a $3000 non-refundable deposit to hold your space. Prior to 90 days from March 6th 50% of price paid will be retained and 50% returned to you. Less than 90 days to March 6th, we are locked into contracts that do not allow us to change our reservations. If you want your reservations to be refundable under 90 days, please contact me directly and I will work out what the refundable cost of the trip is for you. GuruPrem & I, will be teaching in Nevada City on February 24 & 25th where SiriGian’s Teacher Training group comes together for a powerful 4 day weekend with PrabhuNam Kaur Friday & Saturday. GuruPrem & Simran Sunday & Monday!! Two full days covering the fundamentals of a lasting, correct & purposeful Kundalini Yoga Practice. This course will give new teachers a firm grasp of what is important in a Yoga practice, the dynamics of proper alignment & how this applies to all Asana. .. when you watch Simran, it may seem like this is a long way off for you. But, alignment is about your approach to your practice, your connection to your body and about subtle changes in your movements and mindset. Everyone can learn this.. yes - EVEN you! When a posture feels right and in alignment, the full benefit of the asana suddenly comes into being. 🌟Come and try for yourself with this incredible teacher Simran Kaur Khalsa who has years and years of experience and is revered in the States and around the world. A unique and beautiful opportunity. •How to do asanas you thought you couldn't or were afraid to try! Dieser unvergleichliche Workshop hilft Dir einige Grundlagen neu zu erlernen, die Deine Kundalini Yoga Praxis, Deine Sitzposition bei Meditationen und Deine stehenden Positionen verbessern werden. Diese Konzepte werden nicht nur vorgestellt, sondern anschliessend auch gleich in einer herausfordernden Kundalini Yoga Kriya und Meditation angewandt, so dass diese wichtige Grundlagen Dir auch in Zukunft dienen. Simran Kaur Khalsa wurde als Yogi geboren, da ihre Eltern das Kundalini Yoga East in New York City führen. Sie selbst sagt von sich, dass sie das Produkt von Yogi Bhajans 3HO Experiment ist. Sie ist verheiratet mit dem Posture Master GuruPrem Singh, dem Author der Bücher ‘Divine Alignment’ & ‘The Heart Rules’. Simran Kaurs Stimme ist aus vielen Weissen Tantras und Yoga Klassen bekannt. Ihr tantrisches Har haben viele von uns bereits gechantet. Weitere Informationen über Simran findest Du unter www.YogaWithSimran.com. Nutze diese einmalige Chance, von einer einzigartigen Lehrerin zu lernen! Der Workshop ist geeignet für Anfänger und Fortgeschrittene und wird ins Deutsche übersetzt! Learn from Mastin and other experts on how the top spiritual teachers create online courses, books, retreats, seminars and coaching programs. They will help give you the what you need to launch your Heart Centered Business. Spaces limited to 30 dedicated spiritual entrepreneurs. I will be teaching Kundalini Yoga twice daily to help you break thru patterns and integrate all you will be learning. Come, experience and join together in song, chant, mantra, listening & meditation! Learn about some of the songs that Yogi Bhajan wrote specifically for these times, some are his personal experience, some his unique way of translating the mantra, all are profound and transformative. Learn about the lyrics, go over pronunciation and hear stories about Yogi Bhajan and the lyrics and recordings. There will be Yogi Bhajan stories - his name was Harbhajan which means God Song or Singer, and he loved having musician play music, he had GuruPrem Singh, my husband put many of his lyrics to music and for at least 21 of these songs he had Nirinjan Kaur (who will be our Facilitator at the Oct 6th White Tantric Yoga, and is the one who give the Spiritual Names) sing on the recordings, many of which also will be played during this upcoming WTY course. Claim Your Power LIVE! With Mastin Kipp in Orlando! Two full days covering the fundamentals of a lasting, correct & purposeful Kundalini Yoga Practice and ability to teach this. This course will give new teachers a firm grasp of what is important in a Yoga practice, the dynamics of proper alignment & how this applies to all Asana. Join Mastin for an 7 day intimate immersion experience into the depth of who you are! Space is extremely limited. I will be teaching powerful and transformative Kundalini Yoga Classes to break through our perceived limitations! This is a once in a lifetime opportunity to travel to Sedona, AZ with Mastin to dive deep into your life and unlock your true nature. The value of immersion is that there are no distractions. You are fully focused on YOU for 7 days. Come with us to Sedona and experience cutting edge personal growth modalities and ancient wisdom and practices that will cut to the core of who you are and create instant and lifelong transformation. Covering the fundamentals of a lasting, correct & purposeful Kundalini Yoga Practice. This course will give new teachers a firm grasp of what is important in a Yoga practice, the dynamics of proper alignment & how this applies to all Asana. Spend the weekend developing the art of listening, first to your own voice & heart and then learning how to create beautiful sounds. You will develop our lung capacity, ability to control our the sounds we create and where they come from. You will practice lots of chanting & singing of Mantras from the Kundalini Yoga as taught by Yogi Bhajan. It will be a fun, inspiring, educational & empowering weekend together! We will spend the weekend going in depth into how to build correct asanas, from the inside out. Starting with the Bandha's, Breath, Dristhi (Focus) & Asana. Using the simplicity of Divine Alignment you will recognize patterns that are limiting you, learn how to let go of unnecessary tension that separates you from your pure, true, wholehearted state of being. You will realize more grace and ease in your practice while growing from the inside out. A powerful Kriya and Live Music Meditation will be part of this workshop.